After the breakup of the Beatles in 1971, Paul McCartney formed Wings with his wife Linda on keyboards, ex-Moody Blues guitarist Denny Laine, and American session drummer Denny Seiwell. For ten dramatic and turbulent years, the band weathered the critics, endured pot busts, survived a harrowing recording stint in Nigeria, changed drummers constantly, and produced a great deal of remarkable music. McGee's tale of one of the most successful bands of the seventies—the first book to focus exclusively on Paul's post-Beatles years-tells the stories behind the #1 hits "Listen To What the Man Said," "My Love," "Band on the Run," "Jet," "With a Little Luck," and "Coming Up." McGee reveals the band's inner dynamics and its relationship with the press and public, examining Paul's determination to pursue a new sound, the criticisms Linda initially got from fans and bandmates, and the character conflicts that kept the lineup changing. Appendices include interviews with former Wings guitarist Henry McCullough, a complete discography, a list of singles with Paul's comments on each, and rankings from the sales charts. 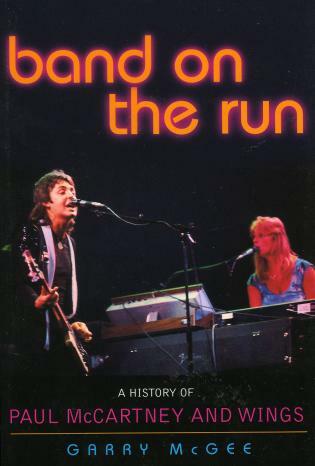 Band on the Run also includes a trove of rare Wings promotional material—album covers, posters, ads, and candid photos of the band on tour. Garry McGee was born and raised in Iowa and is a 1992 graduate of Iowa State University with a BA in Telecommunicative Arts. While there he took classes under such luminaries as Pulitzer Prize winner Jane Smiley and Lee Hadley of the Hadley Irwin writing team. He worked in the Los Angeles film industry for several years and is currently producing a documentary on the last surviving hotel designed by Frank Lloyd Wright. He lives in Mason City, Iowa.